Ministers in the Palestinian government have resigned as part of a cabinet reshuffle, officials say. President Mahmoud Abbas is expected to ask Prime Minister Salam Fayyad to appoint a new cabinet. On Saturday, the Palestinian Authority led by Mr Abbas said it wanted to hold presidential and legislative elections by September. The move comes after the fall of Hosni Mubarak in popular protests in Egypt, an important neighbour. "The cabinet resigned today and the formation of a new cabinet will take place as soon as possible," minister of planning Ali Jarbawi told Reuters news agency. The cabinet shake-up has long been demanded by Mr Fayyad and others in the Fatah faction, according to Reuters news agency. 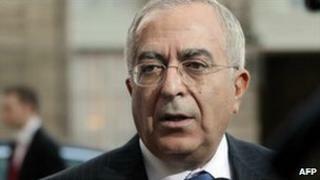 Mr Fayyad, 58, will be asked to stay on in the post he has held since 2007. An aide to Mr Abbas on Saturday said the PA planned to hold long-overdue elections before September. "The executive committee has decided to start preparations for presidential and parliamentary elections in the coming months... no later than September," the PLO's Yasser Abed Rabbo told journalists. The BBC's West Bank correspondent Jon Donnison says the election pledge seems intended to show that Palestinian leaders are responding to events in Egypt and Tunisia. This move is partly cosmetic - many of the Palestinian ministers who resigned today are expected to get their jobs back or move to different positions. But the timing of the announcement suggests President Abbas is trying to send a message that he has been listening to events in Egypt. Mr Abbas is a long-time close ally of the former Egyptian President Hosni Mubarak. Thousands of Palestinians took to the streets last week to celebrate the Egyptian leader's departure. Mr Abbas is also sending signals to his rivals Hamas. Elections were cancelled in 2010 because of the continuing feud between Mr Abbas's Fatah Party and its rival Hamas which controls the Gaza Strip. The bitter divide means the Palestinian parliament has not been able to sit for almost four years and democracy here is on hold. Hamas has already rejected the proposal of new elections by September this year. But in doing so, it risks looking like the one holding democracy back, not President Abbas. But Hanan Ashrawi from the executive committee of the Palestinian Liberation Organisation denies that the reshuffle and plans for elections are related to events in Egypt. "This is part of an ongoing process of internal self-correction, reform and democratisation," she told the BBC World Service. Hamas, who are in control of the Gaza Strip, immediately rejected the plan, saying Mr Abbas had no legitimacy. "Hamas will not take part in this election. We will not give it legitimacy. And we will not recognise the results," spokesman Fawzi Barhoum said. Hamas says the vote is intended to divert attention from the scandal caused by documents leaked by Al-Jazeera TV, which showed major concessions were offered to Israel during peace talks in 2008. The chief Palestinian peace negotiator, Saeb Erekat, offered his resignation on Saturday, although Mr Abbas has not yet accepted it. Mr Abbas' mandate as president expired in January 2009 but was extended until new polls to avoid a vacuum. Elections planned for January 2010 were postponed because of disagreements between Hamas and Fatah, Mr Abbas' secular faction.